We often talk about a “new generation” when describing the use of digital media technique and all applications. For this generation media is something natural; integretaded in everyday life and the difference between consuming and producing is no more. One aspect of the mediated society is how this “new” generation, especially Generation Z, integrate design in everyday life. From an early age they are connected and design as communication strategies and commercial messages are everywhere in their lives. Everything around is part of the identity formation, their own and the social world around them. Two examples from our fieldworks. A girl 8 years old follow her mom and dad to IKEA. They are supposed to buy a new bed to the girl. The parents find several beds that they like, the girl becomes more and more grumpy. She sits down and says that she wants to go home: My bed in Sims is the only I want. A boy 6 years old helps his mom to make lunch. He’s responsible for holding the eggs until the mother needs them. 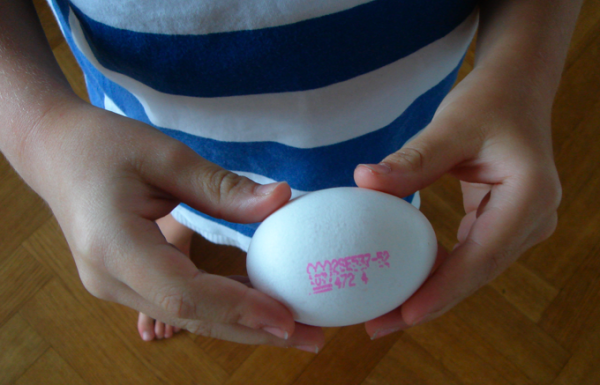 He carefully looks at one egg and the red stamp and suddenly says: Oh, this is designed by ICA! Lustigt hur barn faktiskt utan att ifrågasätta tror att mat är “designat”. Jag har också varit med om detta vad gäller min dotter som är fem år. Hon brukar säga när vi handlar mat: Vad snyggt dom designat dom här tomaterna. Ordet design och designat är inte konstigt alls att använda!